Want to feel heard? Make these five communication tips your new workplace resolutions. Don’t take this personally, but more likely than not, you’re not giving 100% at your job. In fact, there’s a good chance that you’re reading this while at work. If so, you’re not alone. A recent Gallup study revealed a startling statistic: 70% of U.S. employees are not engaged at work. A major cause for this disconnect is that people tend to be really, really bad at communicating their wants and needs. Learn to do that, and you’ll stand a much better chance of staying calm and resentment-free, and possibly even landing the kind of assignments you’ve been longing for. 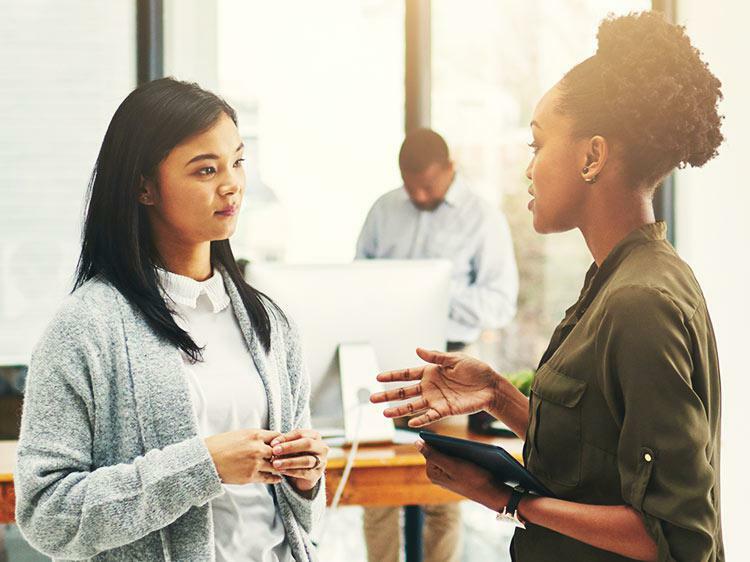 Monster asked career experts for tips to help you improve your communication skills, so you can go from feeling disengaged to practically ecstatic about your job. In some ways, being a “yes man” can serve you well in your career, but it’s easy to slip into the “I need to please everyone” mode and get overwhelmed. Bite off only as much as you can chew at one time. If you say you’re going to finish a PowerPoint presentation by Friday, do it. If you can’t do it, don’t commit. It’s better to say no to something upfront than fail to complete the assignment. “This is critical in business because you gain credibility, trust and respect on the job,” Thomas says. As much as you adopt the advice from Resolution No. 1, you’re likely still going to be overworked at times. (Such is life in the working world.) That makes communicating when you’re feeling overwhelmed critical to your long-term success. Want to be recognized as an informed, interested employee who looks out for others? One of the best ways to do so is to pass along relevant news to the people you work with. “It doesn’t have to take hours of your day, but if you are surfing the internet, listening to the radio or reading the news and you learn something that might be useful or interesting to your team, take a few moments and provide them with that information,” says Brandon Slater, cofounder of Life's Secret Sauce, a company that works with people to improve communication skills and confidence. Instead of shooting your co-worker an email every time you need an answer, try to save all of your questions for one communication—whether that’s in a conversation or an email. This way, you won’t be guilty of the very thing you’re trying to avoid in Resolution #2. Good communication isn’t just about expressing yourself; it’s also about asking the right kind of questions so you’re able to receive information as successfully as you deliver it. Let’s face it—questions that only require yes/no answers aren’t going to tell you much. But asking questions that begin with the five “w”s gives the person you’re talking to the chance to share his or her knowledge with you. That’s when you’re really engaging in effective office communication.